• Do the child's knees bend comfortably over the edge of the seat? • Does the shoulder belt cross between the child's neck and arm? 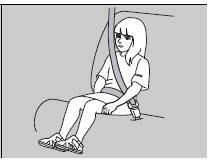 • Is the lap part of the seat belt as low as possible, touching the child's thighs? • Will the child be able to stay seated like this for the whole trip? If you answer yes to all these questions, the child is ready to wear the lap/shoulder seat belt correctly. If you answer no to any question, the child needs to ride on a booster seat until the seat belt fits properly without a booster seat. Allowing a child age 12 or under to sit in front can result in injury or death if the passenger's front airbag inflates. If a larger child must ride in front, move the vehicle seat as far to the rear as possible, have the child sit up properly and wear the seat belt properly, using a booster seat if needed.